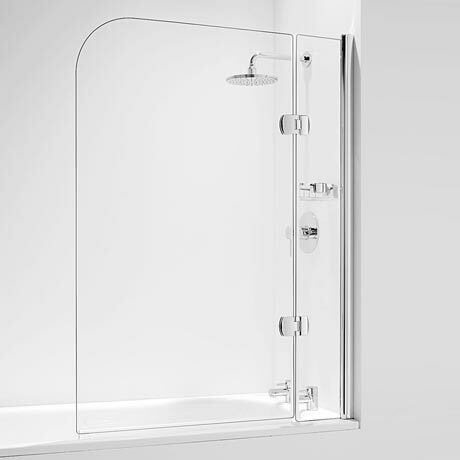 This curved hinged screen provides the user with a choice of 2 sizes of curved bath screens. Whichever size, the screen is a very attractive, practical screen. The side panel is fixed and features an additional storage tray, the side panel and door are linked by 2 stunning chrome designer hinges. Hi Nicola, this product will pivot both ways from the hinges. Thanks! Hi, the width of the fixed screen is 250mm. Thanks! Q. Hello, You say this is curved. It doesnt look curved in the picture, Would it do a p shaped bath? On this occasion, 'curved' refers to the curved corner of the screen. For a P-Shaped bath, you would need, for example, Part No. NBBS1. I am so happy with my pruchase of this Hinged Curved Bathscreen, It was well worth spending that little bit extra for a good quality item. The design is excellent with the panel and and hinged door. The curved edge really give it class and style. Excellent quality and superb service.